Globe telecom functions are continuously upgrading. Now, not only load denominations can be shared to your friends and family. They have added to their Share-a-Load the new Share-a-Promo. This new characteristic lets in a globe/tm user to load any other globe/tm user with a GOSURF or unlimited promo through their load sharing system. 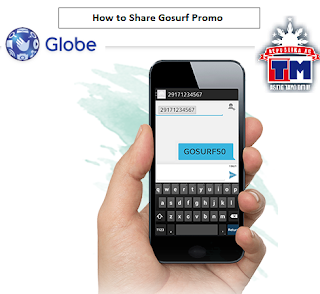 You now not should visit your load shops to have a GOSURF or unlimited promo. Just ask your friend to load your sim and get in touch in the online world.Send GoSURF to any phone, tablet, or Mobile WiFi stick and share the fun with your loved ones. You'll be charged P1 for each successful transaction. GoSURF. Dial *143# from your Globe mobile phone,then choose Share-A-Load/Promo. GoSURF10, GOSURF15, GOSURF30, GOSURF50, GOSURF505D, GOSURF99, GOUNLI 30, SUPERUNLI 25, GOIDD 200 and GOSURF299. Lets discuss also on how to share a load we all know this is commonly knowby the old subscriber but i just want to add this to those new user in globe. On top of the shared load, you will be charged P1.00/text. no. of points you want to share then send to 4438.
no. of points PIN then send to 4438.